Week 3 of the NFL season was one of the most unpredictable so far this season. It also so more controversy over the replacement referees. It was a very exciting group of games, so let’s take a look at 2centsworthofsports.com’s top 3 stories from this week in the NFL. The replacement referees have been atrocious the season. They have missed many calls and made wrong ones as well. On Monday Night the stand in refs made the worst call of the season. In closing seconds of the final quarter with the Packers leading the Seahawks 12-7 the unthinkable happened. Seahawks QB Russell Wilson completed a pass to Wide Receiver Golden Tate for the win, or did he. What actually happened was Packers Defensive Back M.D. Jennings intercepted the pass and had it wrestled away from him by Tate while on the ground. The play was reviewed referee Wayne Elliot who stated ”the ruling on the field stands”. The Seattle faithful loved it but NFL fans everywhere were outraged. This seasons referee’s have been horrible and until the lock out ends with the veteran refs we might be seeing a lot more games end this way. The season has only seen a few up sets during the first two weeks of play. Week three brought with it many upsets. The lowly Jaguars defeated the Colts on the road by a score of 22-17, outscoring the Colts 19-3 in the second half. The Chiefs defeated the Saints in overtime 27-24. The Bengals beat the Redskins 38-31, with excellent play from their QB Andy Dalton who threw for over 300 yards and had 3 TD passes. The Titans stunned the Lions 44-41 in overtime. The 49ers were defeated in the Metro dome by the Vikings 24-13. The Steelers lost to the aiders 34-31, even though “Big” Ben Roethlisberger had a great game with 384 yards passing and 4 TD’s. It was a wild and crazy Sunday. Who know maybe we will see more of this as teams that have been lower level become stronger and more competitive. On Sunday afternoon the Houston Texans came into Denver to face the Broncos. What happened would be one of the most gruesome sights in recent memory. The Texans QB Matt Schaub dropped back for a pass and was tackled by two Broncos Defenders simultaneously. His helmet popped off and he immediately grabbed his ear. When he removed his hands from his head he was missing a chunk of the upper portion of his ear. Schaub showed his toughness and continued to play throwing for almost 300 yards and had 4 TD passes. The Texans won the game by a score of 31-25. On Sunday morning the statue of Penn State football coach Joe Paterno was taken down and put into storage. The new school administration figured it was in the best interest in the wake of the Jerry Sandusky trail and Freeh Report to put the statue away for now. That did not save the football program from the NCAA’s president Mark Emmert and his wrath. On Monday morning Emmert announced the punishment that the school would receive for the previous administration knowing and not reporting Sandusky’s criminal acts on minors. 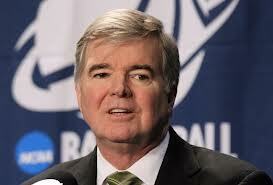 The president of the NCAA, Mark Emmert. The punishment levied on the school was announced as being unprecedented and it was exactly that. The school will be fined $60 million, which is about what the football program generates in revenue during a single season. The football team cannot participate in any conference championships or bowl games for the next 4 years. The football program will be reduced in the amount of scholarships it can give out in the next 4 years. Instead of the usual 25 scholarship the number will be reduced to 15. The players on the football team will be allowed to transfer to other schools without having to sit out a year before being aloud to play again. The most shocking punishment came down not on the school but their legendary former head coach Joe Paterno. All of his victories that he received while coaching between the years of 1998-2008 were vacated. The interesting twist to the punishment is that coach Paterno reached the record and broke the record for most wins by a college coach in 2001. 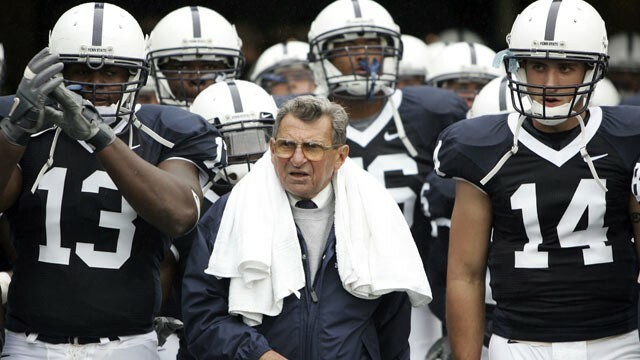 Paterno will no longer be considered the winningest coach in college football ever again. Joe Paterno along with the former administration of Penn State led the football program down into the depths. The NCAA really pulled no punches in this announcement. It was the right decision. The schools administration and Joe Paterno sat back after they knew what Jerry Sandusky was doing and did nothing about it. Paterno instead of reporting the allegations he received about Sandusky went to the administrators of the school. Paterno should have gone to the police, there is no chain of command when criminal acts of this sort are taking place. The punishment on Paterno is correct and is going to leave the black mark on his legacy that he should have. As far as the school goes their punishment is deserving as well. Penn State should consider themselves lucky that they did not receive the “Death Penalty”, like the once great SMU received in the 1980s. This way the school will at least have the chance to rebuild their legacy. I think it will be very hard for them to do so. The football program will be tarnished forever. What happened behind the scenes of that school’s football program over the last couple of decades is disgusting. Sandusky is about to spend life in jail after being found guilty on over 40 charges of child molestation. Joe Paterno is no longer considered the great man and coach he once was. The school will have to deal with the results of bad decisions by many people. This is the new legacy of Penn State football, let it sink in.